Eddie Doherty is one of the legends of Irish handweaving and so meeting him and his wife Evelyn was not only a great honour in itself but a rare chance to get a glimpse of an authentic but sadly diminishing way of life. Eddie’s shop on Ardara’s High Street houses one of his handlooms and from here he sits weaving and chatting to visitors. When Craft Editions met him we were touched by how physically connected he is to his handloom. This should come as no surprise since he has been handweaving for most of his life. As he talks he constantly runs his hands across the yarn and cloth, it’s like the handloom is a part of him. Indeed Evelyn would say ‘he thinks of thread all the time.’ While Eddie weaves, his wife helps by doing the books and sewing labels into the garments. The shop and studio is next door to the family’s pub where Eddie has a second handloom. Back in the day Eddie would weave by day and work the bar at night, now though his son runs the pub. Ardara in County Donegal has a long history of handweaving. When Eddie started in 1956 the tradition of spinning and weaving was simply the local industry in that particular area – primarily because of the quality of Donegal sheep’s wool. Evelyn never learned to weave because historically women washed, spun and twisted the yarn whilst the men wove the cloth. 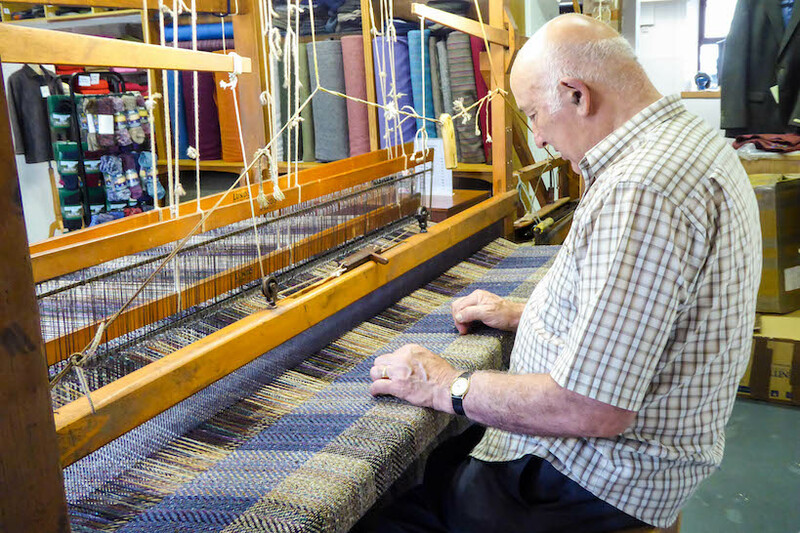 When Eddie started there were over 200 handweavers in Ardara alone, now Eddie is unusual in being one of the few remaining master weavers in the whole of Ireland. At that time it was all piecework with weavers paid per item rather than by the hour, this encouraged people to work more quickly. With over 60 years’ experience Eddie can produce approximately 4 metres of cloth per hour. But even with his level of expertise handweaving is a slow process. It takes a full day, which can be up to 12 hours, to set up the loom for a complex piece. It’s highly intricate work; every single thread has to be taken through each eye of the loom in preparation. Although Eddie weaves mainly herringbone and salt and pepper tweed he likes to add different colours to enliven the pieces a little. When we visited Eddie he was working with a subtle purple fleck. None of Eddie’s threading patterns are written down though, they are all created and stored in his head. John Heena is another local master weaver who we were lucky enough to meet. It was touching to hear the respect with which Eddie talks about John. He described him as ‘very talented’, citing not only his craftsmanship but also his ‘arty’ mind that comes up with ideas for creative patterns. Eddie employs a local seamstress to make his tweed into waistcoats, capes and caps that he sells from his shop, but even now both he and John continue to weave cloth for Magee’s tweed jackets. Not only is Eddie keeping the tradition of hand weaving alive through his own work but he has also become an expert in authentic vintage looms themselves. When one of the last factories closed 17 years ago he bought up their remaining stock. Sadly, many of the handlooms in the area were burned for firewood or left to rot during the decline of the weaving industry in the 1980s. So Eddie is now one of the few people who can supply original wooden handlooms. 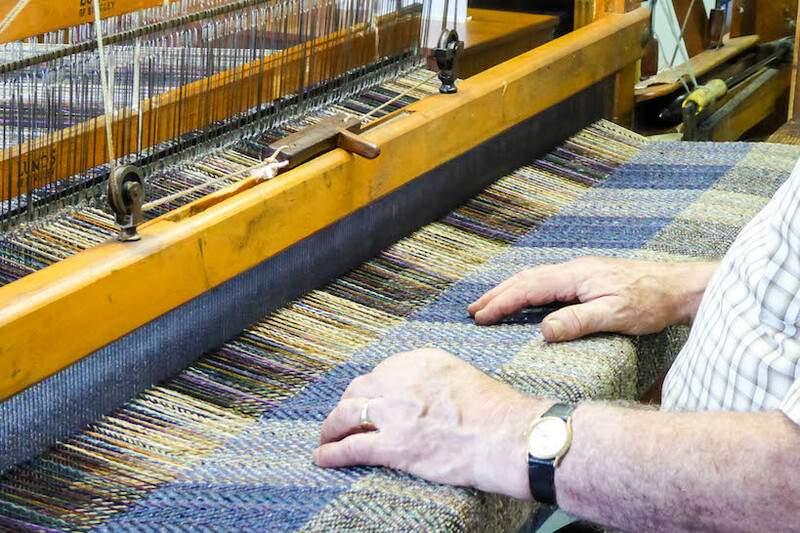 In spite of the overall decline of Ireland’s weaving industry, there has recently been a resurgence in people’s desire for quality tweed made by hand. Eddie’s shop is often busy with customers looking for traditional clothing, especially from the US, Canada and Australia where they simply don’t have a handweaving heritage. 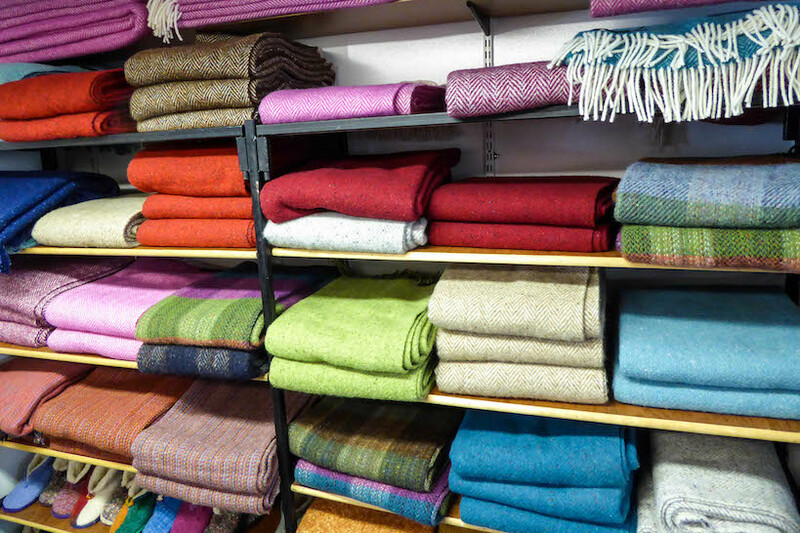 Eddie also receives commissions from interior designers requesting beautiful throws for boutique hotels. His delighted customers have gradually built his impressive reputation that reaches worldwide. Eddie starts work at 8 o’clock every morning and it certainly keeps him fit! When Evelyn tries to get him to slow down Eddie simply replies ‘Sure what would I do?’ Weaving is his life and he loves it. Find out more about Eddie Doherty here.